Following on from last December’s hugely enjoyable ‘Ahmet We Did It’ 02 Ten Years Gone event at this venue, we went back to the pub on Sunday for another day of Led Zeppelin 50th Anniversary Celebrations. Mike Tremaglio and I were on next the to unravel the story of how we researched and compiled the 280,00 words and 576 pages that make up the Evenings With Led Zeppelin book. As mentioned last week with no books in the UK aside from the one we had to show, it was a bit frustrating to say the least. Julian did a great job keeping the interview flowing – it was captured on a YouTube clip that can be viewed below. The always illuminating Chris Charlesworth talked about the recent Jimmy Page biography by Chris Salewic and what makes what makes a good rock biography – or not…his wry comment that it had to be literate and the author should possess an A level in English had me shifting rather uncomfortably next to him. A level? I didn’t take O level so that’s me done for! Next up – the renowned journalist, author and broadcaster Patrick Humphries revealed the links between Fairport Convention and Led Zeppelin and his experiences of interviewing Jimmy Page and Robert Plant. 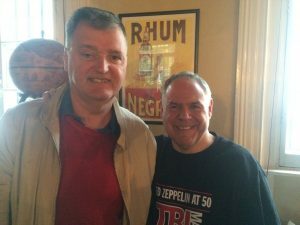 Again like Chris, Patrick’s inside views made for a hugely enjoyable chat. Patrick has recently compiled A Tree With Roots- Fairport Convention and Friends Song Of Bob Dylan CD on Universal. 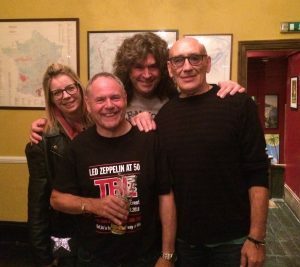 Final guest speaker was Phil Tattershall – the well known UK Zep CD collector/authority who presented ‘Confessions of a Led Zeppelin Taper’. This was a highly humorous and entertaining overview of Phil’s experiences in taping Led Zeppelin and the subsequent solo appearances of Jimmy ,Robert and Jonesy. His accompanying visuals were also great – it was really interesting to view the various tape machines Phil had used over the years. 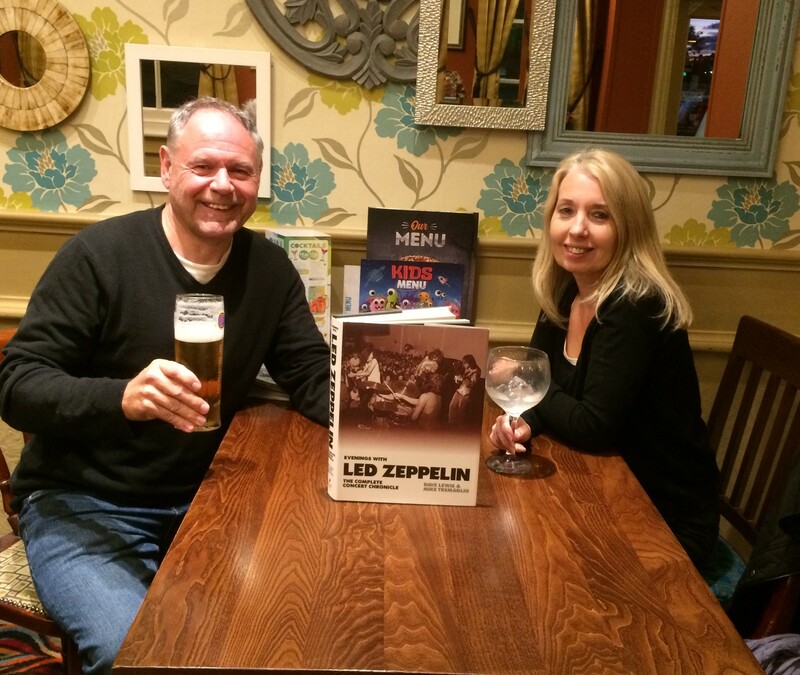 Finally the Led Zeppelin Quiz -50 at 50 as compiled by Andy ,myself and Gary Davies. 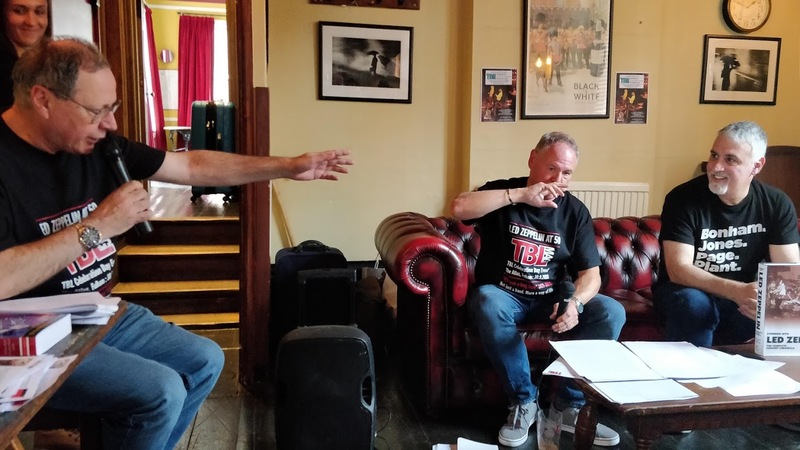 50 Zep brainteasing questions – as we were running somewhat late ,we did this as a shout back – the usual suspects of Eddie Edwards, Phil Tattersall and Ian Avery fared the best. 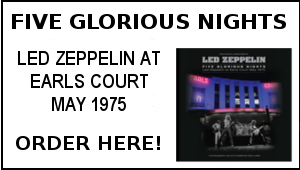 To wrap the day we showed some Zep Earls Court May 24, 1975 footage. It was fantastic to see so many friends and new and old faces in attendance including Mark Harrison Simon Pallett, Andy Adams ,Luis Rey, Eddie Edwards, Phil Tattershall, Trev Butcher, John Webster, Dieter from Germany, Andreas Stocker, Davide from Italy, Horace from the US, Andrew Doyle, TBL website creator Dave Linwood, Dave Fox, Rudi O’Keefe, Gerd from Germany, Melvyn Billingham, Jez Firth, Ian Dixon, Alan Stutz, Lee Matthews, Paul Sheppard, Brad Day, Sue Wilson, David Johnstone, Richard Schofield, Mark Windslade, Simon Cadmon, Tuhin Chowdhury, Cliff ‘The ticket man’Hilliard, Hiroshi, Richard Bedford, Ian Avey and many more. 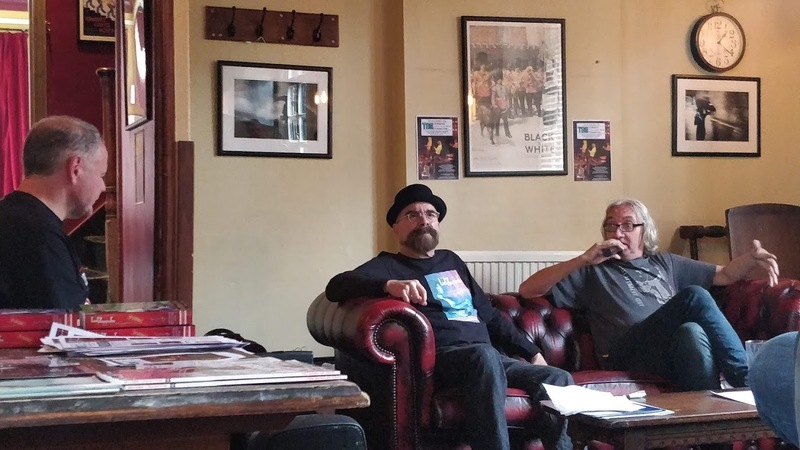 Pics here with Mark Harrison plus Julian, Luis and Mike T. Andy Adams and Simon Pallett, Melvyn Billingham, Dave Linwood and Dave Fox, Eddie Edwards and Phil Tattershall Thanks to Andreas Stocker for pics above. So a fantastic day when once again we proved that Led Zeppelin are not just the greatest band- they have the greatest fans. 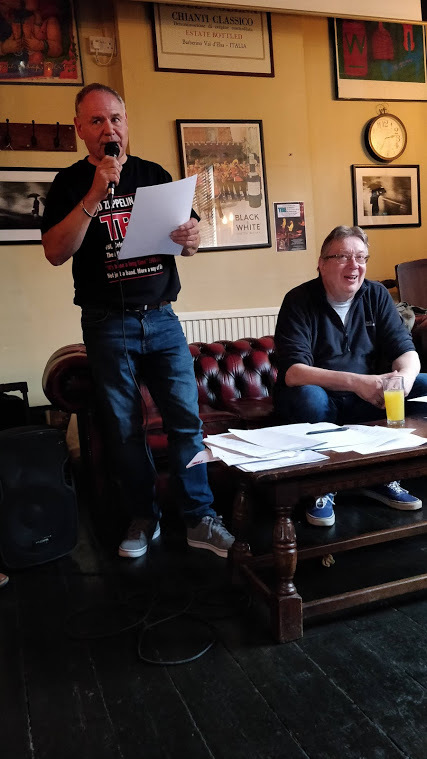 Very special thanks to Julian for all his help in making this happen, Richard Grubb, Andy Adams, Gary Davies, Mike Lowe and Jen, Renee and Kate at The Atlas pub. 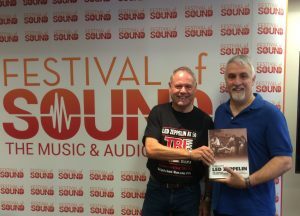 Before all that, on Friday Mike and I presented we had been in attendance at the Omnibus Press Evenings With Led Zeppelin book launch at Festival of Sound – The Music And Audio Show staged at the Novotel in Hammersmith. This was an excellent opportunity to promote the book. We had about 50 in – people all new to me so we were gaining new interest in the book. There was one very familiar face – it was great to see Gary Foy in attendance. 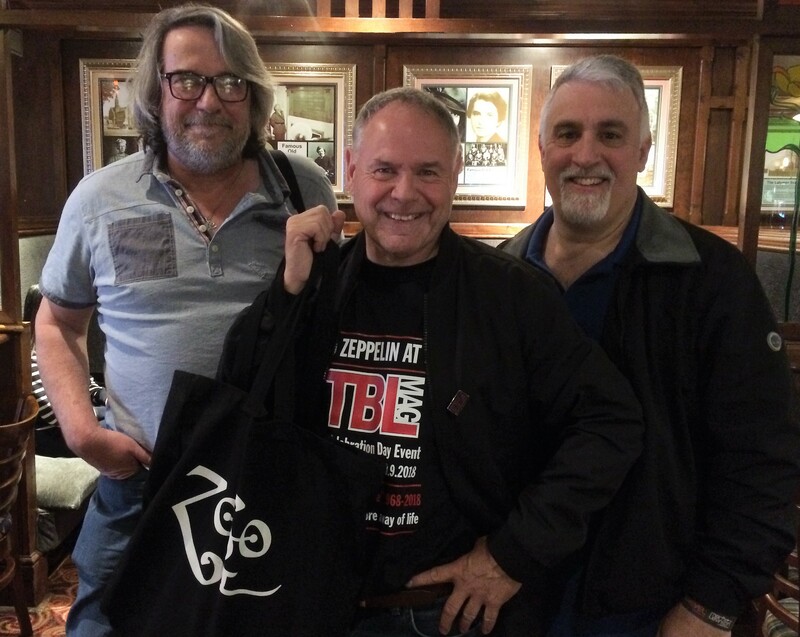 Afterwards, we adjourned to the pub where Mike Tremaglio was able to get very involved with all the TBL talk that goes on – something he experienced throughout the weekend. Copies of the book are now in the warehouse and will be going out to Amazon in the next few days – I would expect Amazon pre-orders to be fulfilled around October 11. It should be in Waterstones and WH Smith around then to. Unfortunately a change of distributor in the US over the Summer has caused a delay. Omnibus inform me they hope to have books ready for distribution in late November for a publishing date of December 3. Pre order links on Amazon etc, should appear in the next month. Omnibus inform me copies should be in Australia by the end of the month. The TBL edition is in a run of 100 all individually hand numbered and signed by me. 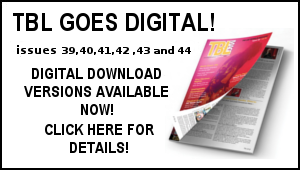 The ordering links for these items will be up on the TBL website soon. The interview I recorded for Planet Rock with DJ Ian Danter, in which we discussed the Evenings With Led Zeppelin book and ten of the greatest Led Zeppelin gigs was airedlast Wednesday September 26 at 7 pm. This week, the Ninth Circuit Court of Appeals in the US ruled that Led Zeppelin must face a retrial in the “Stairway To Heaven” copyright case. Led Zeppelin won in a 2016 trial which ruled that there was not substantial similarity between the introduction to Led Zeppelin’s song and “Taurus” by Spirit. However, the plaintiff’s lawyer appealed on the grounds that the jury in the 2016 trial was unfairly barred from hearing the recorded version of “Taurus.” The Ninth Circuit Court of Appeals has now partially vacated the 2016 verdict and the case has been remanded for a new trial. All of the surviving members of Led Zeppelin ended up involved in the 2016 trial, and this news will be very unwelcome for the band, especially as it came during Led Zeppelin’s fiftieth anniversary celebrations. 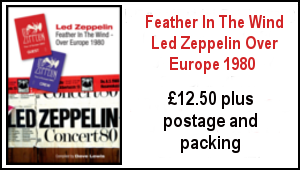 Talking of those fiftieth anniversary celebrations, Led Zeppelin officially kicked things off this week by releasing the band’s Record Store Day single in digital formats. The Sunset Sound mix of “Rock And Roll” and the Olympic Studios mix of “Friends” are both available to stream and download. 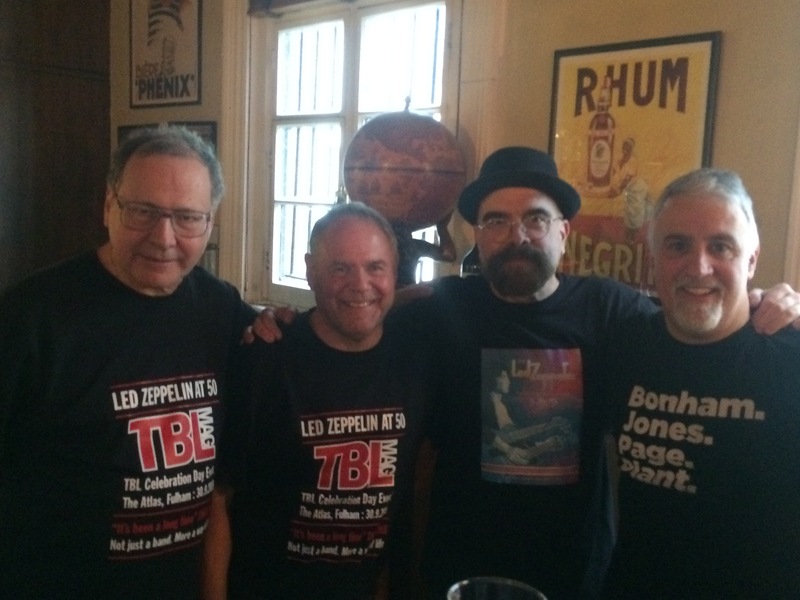 The band also quietly released a series of interview clips with all three surviving members. Japanese bootleg label Empress Valley released a partial soundboard recording of Led Zeppelin’s September 29, 1971 Osaka, Japan show this week. It isn’t the full recording, though, and even cuts off some songs that have already been released to promote this box set. The bootleg label included a rather angry message in the box aimed at one customer who has been uploading releases online. Led Zeppelin held a launch party for the band’s new official photography book at the National Portrait Gallery in London on September 24. Jimmy Page was the only surviving band member who attended, although he was joined by guests including Led Zeppelin’s former tour manager Richard Cole and photographer Jørgen Angel. The photo book is now on sale in the gallery’s book shop. On September 25, Jimmy Page’s website published a new “On This Day” entry which provided new information on the earliest days of Led Zeppelin. The website included a worksheet showing the dates of the recording sessions for the band’s debut album. 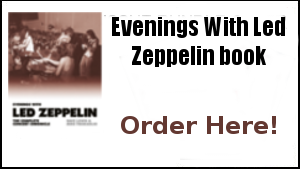 Tight But Loose editor Dave Lewis’ new book, “Evenings With Led Zeppelin,” has been delayed until October 11. Find out more about the book here. 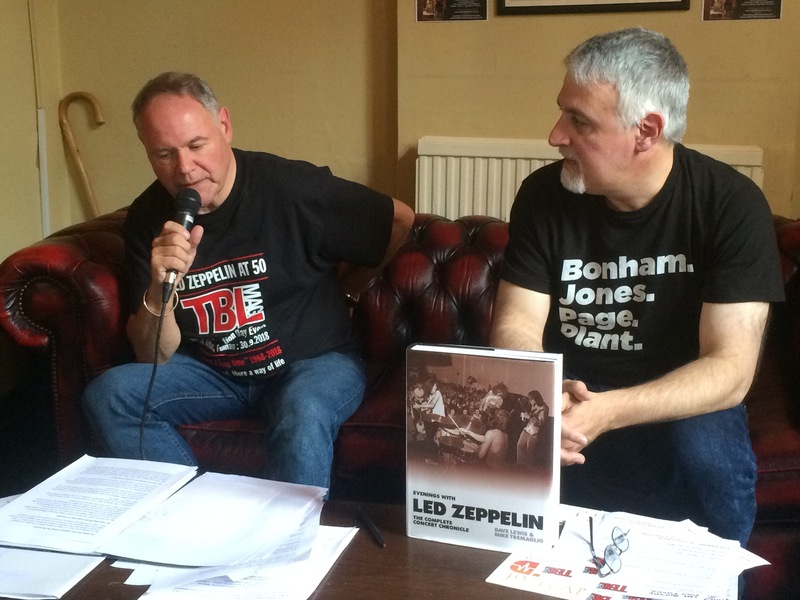 The latest episode of unofficial Led Zeppelin podcast Ramble On Radio discusses the 1983 ARMS charity concert at the Royal Albert Hall in London. Robert Plant played several shows this week. See the setlists below and click the links to watch videos of each performance. Nile Rogers said in a new interview this week that he’s keen to work with Robert Plant again on a new Honeydrippers album. 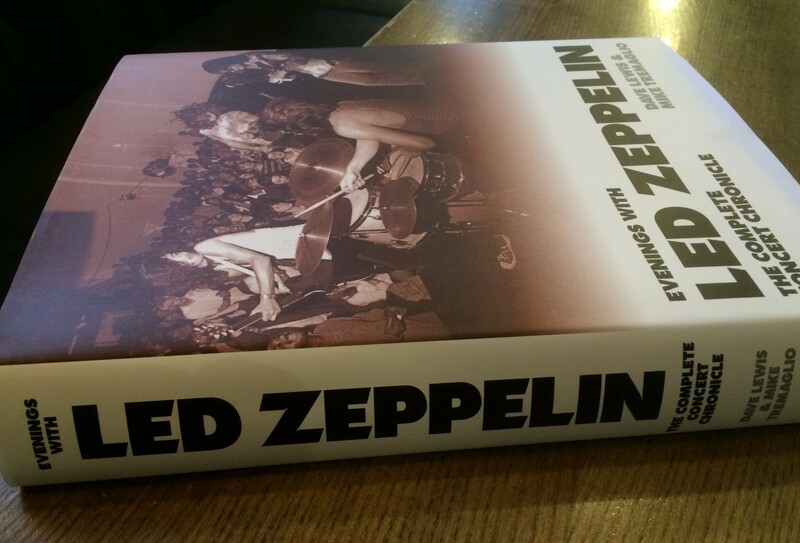 October 11 – The “Evenings With Led Zeppelin” book will be released. Sunday is John Lennon’s 78th birthday. The events of 38 years ago surrounding his comeback album Double Fantasy and his shocking death in December are intrinsically linked for me with the tragic events going inside the Zep camp this time back in 1980. I can vividly remember Simon Bates airing the Starting Over single and there was a real optimism about his return to recording. 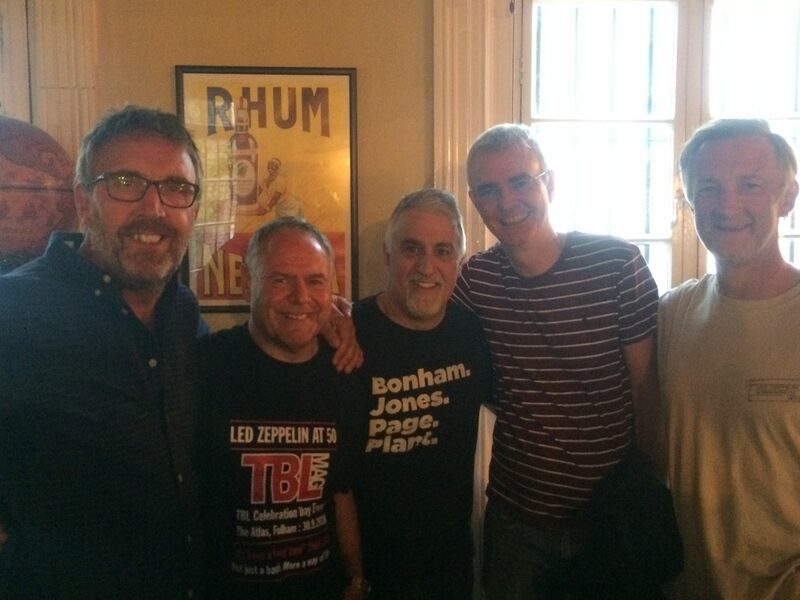 I purchased the album in the Kings Road in November after a visit to the Swan Song offices. That optimism (as with the Zep events) turned to agony on the morning of December 9th when the news broke here that John Lennon had been shot dead in new York. I’ve recently been playing a lot of Beatles in preparation for the forthcoming White album 50th anniversary edition – namely their first four albums -Please, Please Me, With The Beatles , A Hard Days Night and Beatles For Sale. .
It’s a stark reminder of the sheer exuberant joy of his rasping vocal in those formative years. Performances such as Please Me, Eight Days a Week etc are ample evidence of his genius – John Lennon is right up there in my top five vocalist of all time. His post Beatle output has it’s moments for sure but what he achieved in those short eight years between 1962 and 1969 is awe inspiring. Hearing those innocent upbeat early Beatles tunes has been a tonic this past week. 56 years ago this week – on October 5 1962 , The Beatles first single Love Me Do was released. 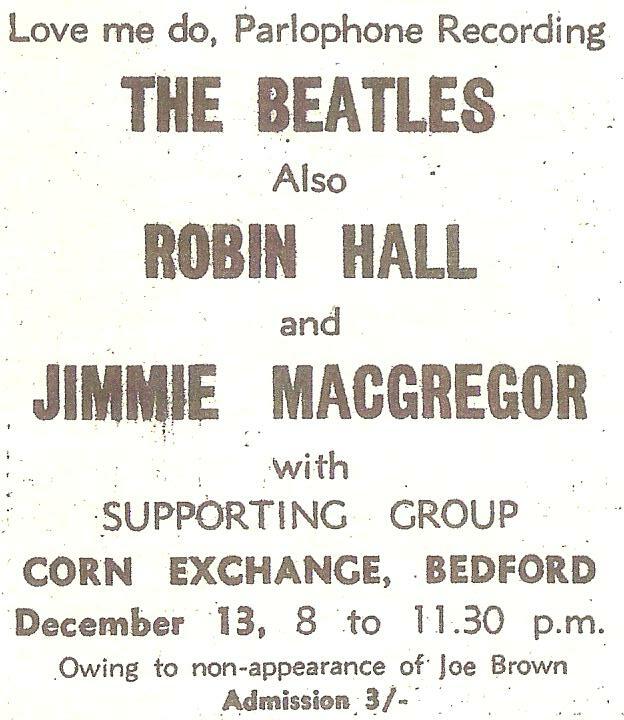 A couple of months later – on the night of December 13, The Beatles performed at the Corn Exchange venue in Bedford. They were a replacement for Joe Brown and were supported by Robin Hall and Jimmie Macgregor. 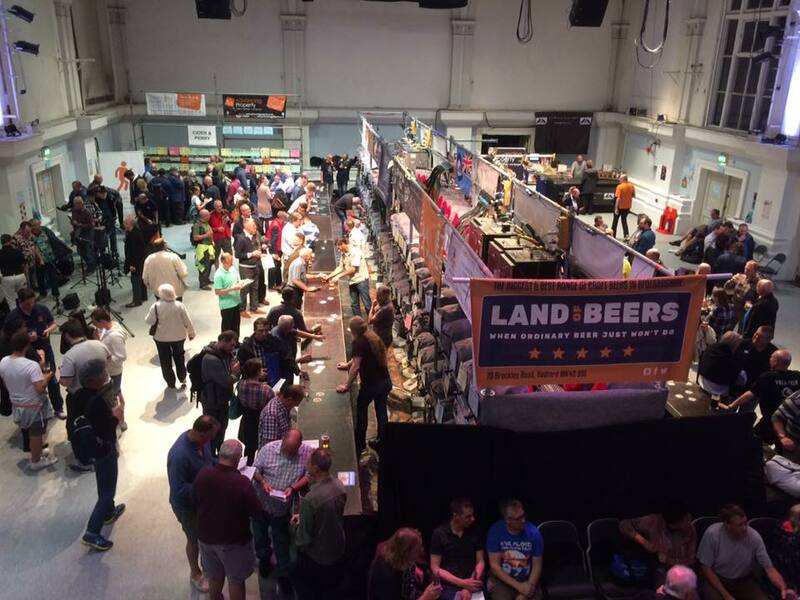 The Corn Exchange venue is still going strong and will be the destination for many a real ale beer drinker in the next few days as the 41st Bedford Beer Festival tales place. 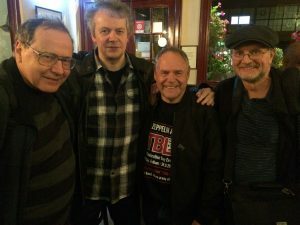 I’ll be popping in as I usually do over the three days at some point – in fact I was there last night – and had a pause for thought to look around the hall and recall when the fledgling Beatles made that visit back in 1962. Well that was some few days – as all mentioned above, it was fantastic to finally meet Mike Tremaglio. 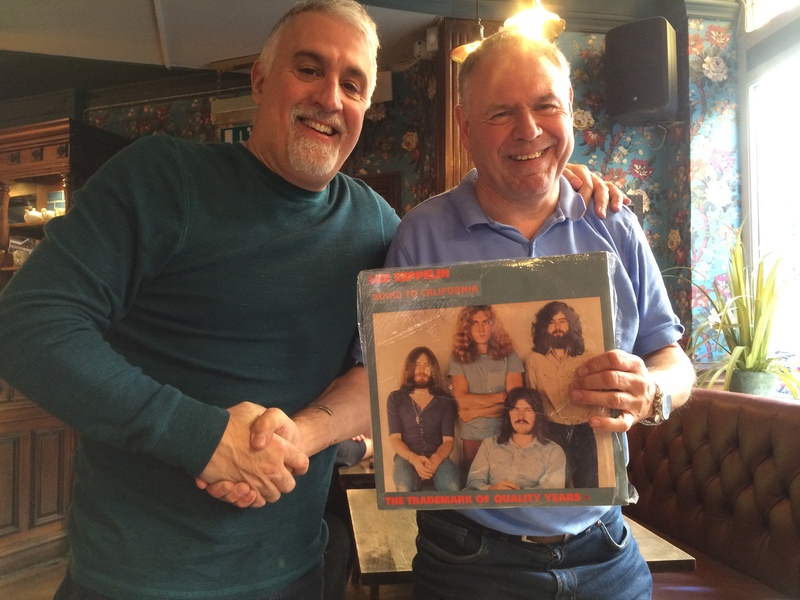 Another of many highlights of the last few days is when Mike handed over a present for me – a copy of Going To California -the Trademark of Quality Years double album – what a gem! Many thanks Mike and for everything else he has done to make this book such an incredible piece of work. 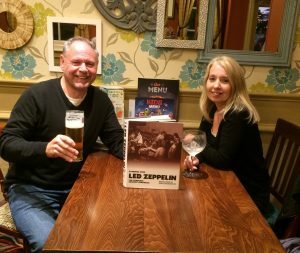 As previously documented, there have been many trials and tribulations bringing the Evenings With Led Zeppelin book to fruition – not least the frustration of not having books in the country last week when we really needed them. 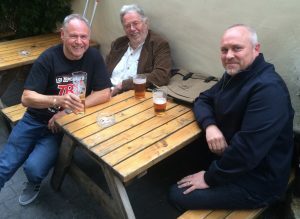 For several reason, it’s been a somewhat bittersweet experience all round – as Mike knows only too well..but that will not take away the immense pride we feel in completing the book. The good lady Janet’s verdict on anything I write is always honest and objective and usually correct…therefore her assessment that every Led Zeppelin fan will love this book and needs to own it is an opinion I value highly – and looking over the 576 pages, one I certainly agree with … this is a book as a Led Zeppelin fan, I would certainly want to read again and again – and that is exactly why Mike Tremaglio and myself spent years perfecting it…it’s coming your way soon…let me know what you think.. 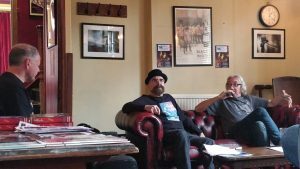 Very enjoyable clip of you and Mike at The Atlas! Congrats to you both and thanks for this treasure! Really interesting afternoon (early evening) out on Sunday. I arrived late so missed Luis Rey. Mark Blake section was very interesting, provided a balanced and insightful view of the late Peter Grant, think the book would make interesting reading. Phil’s recollections of recording escapades was also very interesting. I thought his O7 was great by the way .. lots of bottom end. Makes you think there are probably many more zeppelin recordings out there carried out by people learning the trade that will never see the light of day, and probably shouldn’t (like my recording of Robert Plant in Liverpool circa 2004). 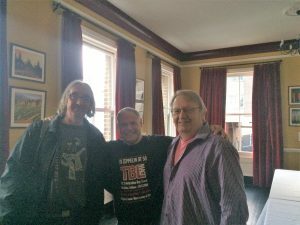 It was great to meet Julian (sorry for responding to the website link you offered me by saying I don’t need any more music downloads), Hiroshi, Eddie Edwards and your good self. I personally don’t think you need as many guest speakers etc to make the event, it would be just as worthwhile for people with similar interests to just get together over a few drinks (4.90 a pint! It’s been a long time since I’ve been boozing in that there London.) Maybe see you next year. One more Beatle Bedford piece of trivia. 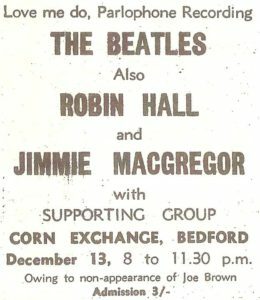 The final time the group played the town, on 12 March 63 at the much lamented Granada, it was as a trio, John was down with a heavy cold. Looking forward to the book Dave, now you need to conquer America with a book signing tour along with mini Zep 50ths across the major US cities (including Denver CO where it all started for Zep in the US). Would’ve enjoyed the Atlas event. Mr. Tremaglio sounds to me like he has a Chicago accent and not a Boston accent. Do I have that right? Great update as usual, and looking forward to ordering the new book which sounds like a treasure trove of information for all fans. 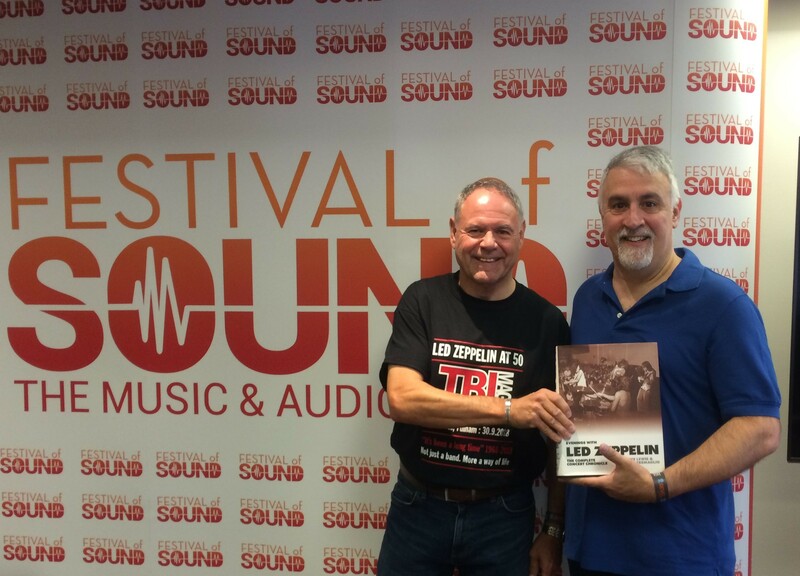 Regarding the book, have copies been made available to any of the band members? Given how this chronicles a significant part of their working lives I wondered if they have shown any interest? Hopefully the 50th anniversary generates much interest in all of the fantastic work you continue to do in keeping their legacy alive. It was a fantastic day, and thanks Dave for the hard work of all involved. 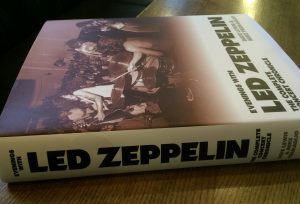 The ‘Evenings with Led Zeppelin’ book looked truly amazing, and I can’t wait to get a copy. The pictures of the venues is a great touch, and the first date I checked was to see if there was a picture of the ‘Cooks Ferry’ inn from my home town of Edmonton when they played there in March 1969. Thanks for a great day!